From several days to a week following the event initiating fat embolism syndrome, there may be loss of consciousness from lesions evidenced by the "brain purpura" as shown here. 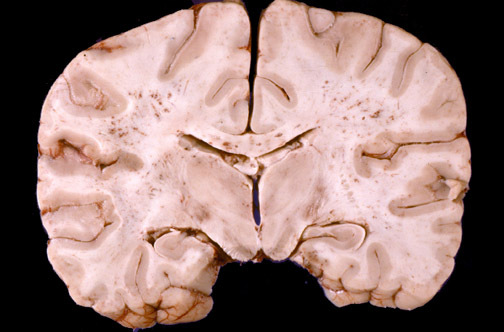 Numerous petechial hemorrhages are produced by fat emboli to the brain, particularly in the white matter. Subsequent to this there can be brain edema with herniation.